Implementing calls-to-action (CTAs) on your social media pages is a must for any brand. 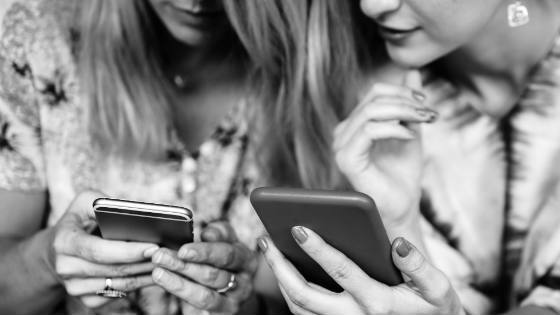 CTAs are available on all three of the major social platforms, and if you’re not taking advantage of them yet, keep reading. First, we’ll show you how to add calls-to-action on your social media platforms, then, we’ll tell you how to optimize those CTAs for better conversion rates. The methods for creating social media calls-to-action are easy and only takes a few minutes a piece. Step 2: Once clicked, a new window will pop-up in your Facebook tab, allowing you to add a variety of CTAs (Book Now, Contact Us, Play Game, Shop Now, etc.). 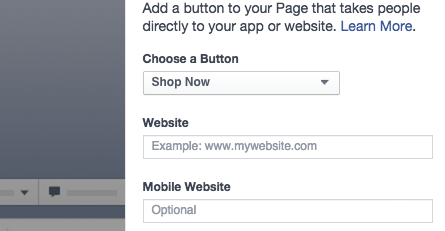 Step 3: After choosing your selected call-to-action you will be prompted to enter two URLs. One will be for website desktop visitors and the other for mobile visitors. 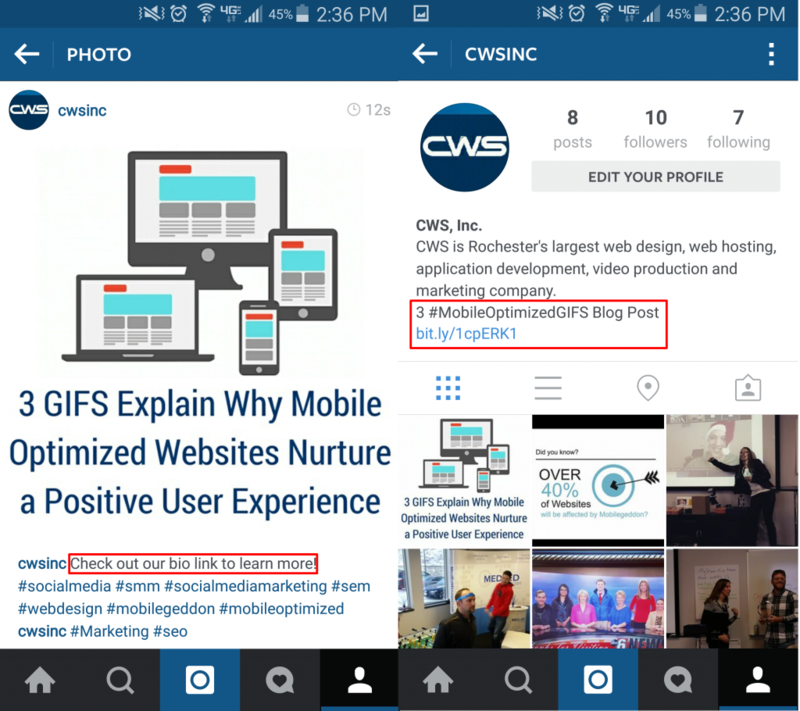 The mobile URL is not required and can be left off, if the page is the same for both desktop and mobile visitors. It’s a bit more tricky to create a Twitter call-to-action. Step 1: Create a tweet about your offer. Step 2: Add relative hashtags and attach an image of your call-to-action. This will broadcast your offer to your followers and followers of the hashtag feed. Step 3: To make it consistently visible, you can pin any tweet to the top of your Twitter page for all new or returning visitors to see. 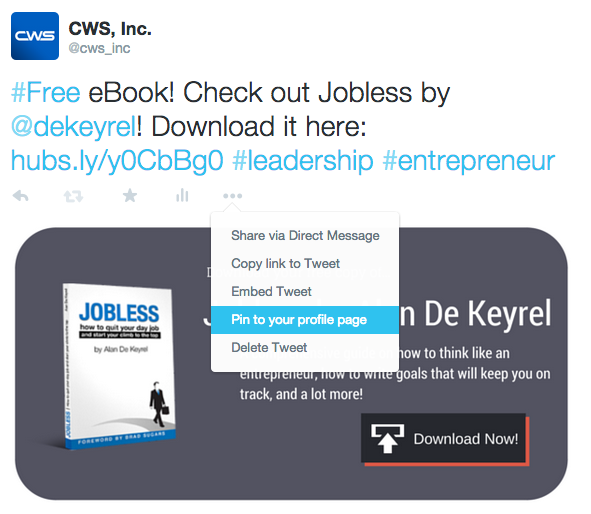 Recently, Twitter has introduced the capability of adding CTA buttons to direct messages. Instagram is another social media platform that can be a bit tricky, but if done correctly can be extremely effective. There are endless possibilities for using calls-to-action in social media posts. Your social media accounts should be used for all stages of the buyer’s journey: awareness, consideration, and delight. Some examples of an awareness CTA could include “read more,” “learn more,” or “discover.” These could be featured on a Tweet with a preview of an article, or on a display ad in the Facebook feed. The consideration stage consists of leads that aren’t quite ready to make the leap. 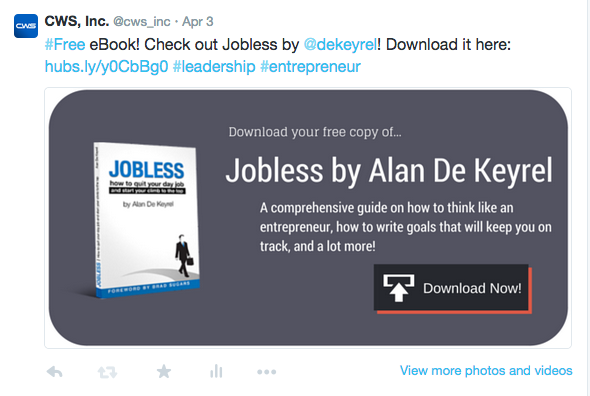 CTAs such as “start your free trial” or “download your copy” work great for offers you may feature on your social. When it comes to delighting customers, using calls-to-action that consist of “register today” or “take the quiz” can work wonders. These examples can be used for special events or customer service surveys. Now that you understand how to implement CTAs on social, look over some tips to optimize for high conversion rates. In this digital age people are expecting you to have a CTA on your page (even if they don’t know it). We are so used to being guided through a brand’s page up to the call-to-action that it’s nearly subconscious. Given this fact, it is of even greater importance to have a visible and well-designed CTA. Luckily, the three major social media platforms do the work for us and already include visible CTA options in their interfaces. So, never feel bad about “bothering” users with your call-to-action - they’re looking for it! Creating a clear benefit for the user is CTA 101. Studies have shown that our attention spans are continually diminishing, so communicating the value clearly and quickly is more crucial than ever. If possible, list the gains in bullet points to highlight the really good stuff. Even better, have the benefits featured in your image. Humans process images and numbers 60,000 times faster than words. Pairing a call-to-action with a professional graphic will build the user’s trust because, let’s face it, we tend to judge books by their covers. However, avoid using the same color for your CTA as the background graphic. You want the user to know exactly what you’re asking them to do: explore, shop, download, find, read, try, get, etc. Avoid using jargon in the CTA and summary of benefits; the user won’t know what you’re trying to communicate, and be instantly turned off. Hubspot also warns against using the word “submit.” No one filling out their information in a form wants to submit to something. Actionable words will draw in the potential customer in and guide them in the right direction. Additionally, too many words in a CTA will not only lose the user’s interest, but cause them to think that the rest of their journey with your brand will be equally confusing and riddled with regulations. Hubspot recommends using five or less words. You don’t want to scare the user; just make sure they know your offer won’t be around forever or there’s limited room. Using words like “now” and “today” will create a sense of urgency, and also demonstrate how simple it is to obtain the value. Never feel bad about putting a call-to-action anywhere you can. Put it on your social media channels, put them on your website and on your blog. Anything that can gather traffic. Make sure to keep track of your results of your social media CTAs by using a link tracking service like bitly to measure and report your results. Good luck! Your not-so-average guide to lead gen. Marketers will promise you out-of-this-world lead generation that can happen in a snap. We're not those kind of marketers. Generating a high quantity of high quality leads isn't going to happen overnight. 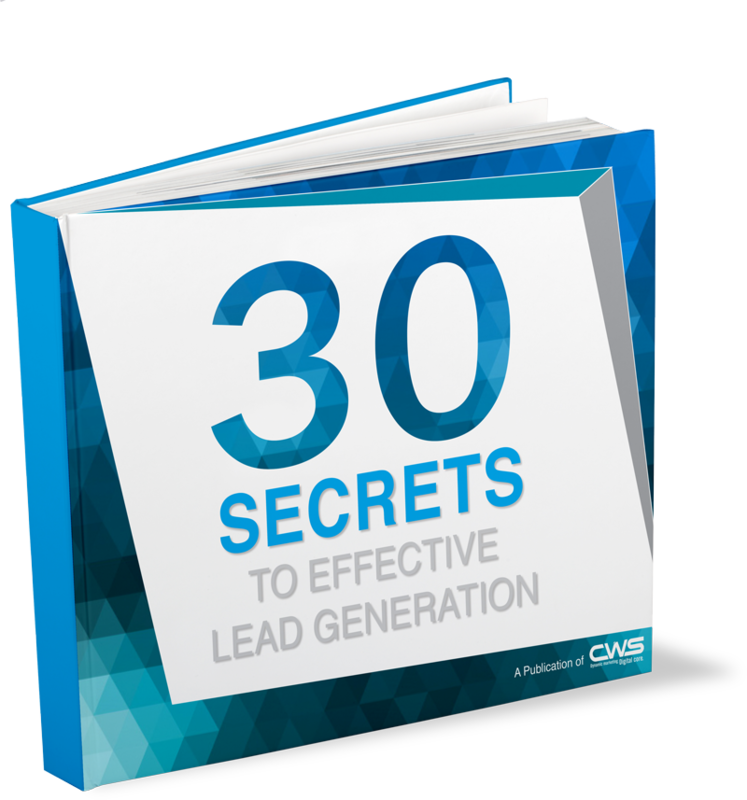 Luckily, you have FREE access to 30 Secrets to Effective Lead Generation, written by CWS founder and president (so you know it's the real deal).